I won’t be the first writer to wail about procrastination, nor will I be the last… but my procrastination just hit new heights. I had every good intention of writing for an hour or so this afternoon, as Son Number 1 is at AusKick with his father, and Son Number 2 was quite happily watching a movie after playing with a friend for most of the afternoon. I fooled myself with the obligatory: before I sit down with the laptop I’ll just check Twitter, Facebook, Goodreads and Amazon, oh, and my email. Twitter for me currently involves checking 4 sites that I take care of; and Amazon means (of course) US and AUS. Then I decided to update Goodreads with the new book I started this morning, ‘Mark of the Dragon Queen’ by Katie W. Stewart. Lily is a founding member of Hearts n Wined, a group for West Australian authors, and readers who love West Aussie settings in their books. 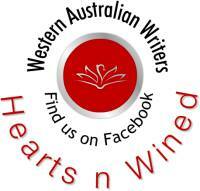 Then I discovered a bright glittery new logo on Facebook made by our own Jennie Jones to do with Hearts N Wined – the West Australian author and reader group that I’m part of. Jennie has made a gorgeous logo for HnW that I could upload to my page… so I did… and you can see it if you visit the ‘About Lily’ section of this site. Oh stuff that – you can see it if you look right here!! Then, I learned that another group I’m part of, the very cool and wonderful, www.naughtyninjas.net are planning a mad nudie-streak at the upcoming Romance Writers of Australia Conference… so I had to have a bit of fun tweeting about that. Then I thought about dinner for a while, but decided it was too early to cook dinner yet, and I really *should* get out the laptop. So out came the laptop. I opened it. Turned it on. And then thought: I will sweep out the carport. Because, I mean – that job hasn’t been done in 18 months since we’ve been living in our rental house, and so NOW is the perfect time to sweep it out? Yes? See. It’s sad isn’t it. Then, once said sweeping was finished, I had to blog about it. Which means today’s wordcount… is ZERO! But the carport is very clean. And I do intend to do some writing tonight! And now it’s time to cook dinner.